We hope all of our families are having a fantastic summer! Our summer groups have been very busy! The older kids have been having fun with games and cooking activities. Some of our trips to date have included mini golf, boardwalk, and lunch at the local pizzeria. The younger groups have been having a blast with activities such as crafts, water play races, a fun “campout” complete with stories around our “campfire,” and fun cooking activities as well. As the summer moves forward we will begin scheduling for our fall/school year session. Please start to think about possible times/days that you are available for therapy and keep a look out for the schedule request forms which will be at the front desk. We ask that you provide three possible day and time options and we will do our best to accommodate! We hope you continue to have a fun summer and stay cool! It’s summer time again at Speech Start and we have a lot happening! Our summer schedules begin the week of June 30th; your therapist will be calling to confirm your schedule. We are excited to begin our social groups again. We have groups for different ages, please call if you’d like more information! We are excited to be working with our friends at Small Factory in Fair Haven again. They are holding a variety of camps for different ages. We will also be holding a social skills group there as well. Please call for more information. We are looking forward to another fun filled summer with you! A live theater experience is a great experience for children. The Paper Mill Playhouse is presenting an autism/sensory-friendly performance of “Stone Soup” and other stories on April 30, 2014 at 10:00 AM. This is a great opportunity for a field trip for grades 1-4 and beyond! Some key features of the performance are dimmed house lights, lowered and consistent volume, freedom to leave seats, a calming corner, BYO snacks and drinks, and more! For more information call (973) 315-1680. Autism/Sensory Friendly Field TripTheater Experience! The Paper Mill Playhouse is hosting an Autism/Sensory friendly performance of Little Red Riding Hood. This is a fantastic opportunity for children with special needs to attend a live theater performance. The accommodations include house lights dimmed, consistent sound level at a lower volume, and freedom to talk and leave your seat. The performance is scheduled for Thursday March 20, 2014 at 10:00 AM. More information can be found by visiting PaperMill.org or by calling group sales at (973) 315-1680. 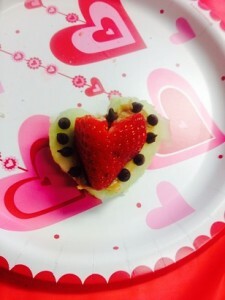 During our group this week the theme was all about valentines, so we made a healthy snack and a sweet treat for the students to enjoy! Each of the student had a part in making their snacks. 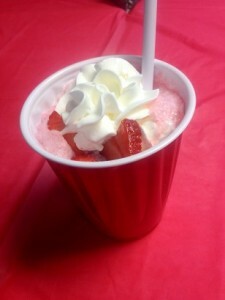 One student poured the soda, while one scooped the ice-cream, and another topped with whipped cream and fruit. We encourage turn taking and helping others during all of our group activities!